After I had my third child something just wasn't right. I wasn't really bonding with him and felt down pretty much every day but didn't acknowledge any of these feelings. I was fortunate enough to have a really amazing midwife called Mary who spotted the tell tale signs of postnatal depression and was quick to alert my husband and offer him advice and support on how best to support and help me. I had a great support network in my parents, sister, husband and a few friends which really helped me face up to my feelings and get the necessary help. Nine years ago, depression was something that was still pretty much a taboo subject to talk about, so I didn't. I got the help I needed and got on with everything that a mother has to. I did start to feel better and started bonding with my little boy but it took four months. A whole four months before I WANTED to cuddle my baby rather than HAVING to cuddle him to soothe him. 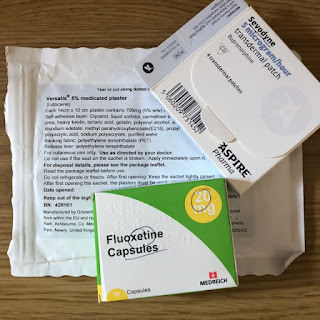 Things got back to 'NORMAL' and I carried on with my life, occasionally I'd have days when I didn't feel great but then after a few years I started to have lots of days when I didn't feel great and the more frequent they got the worse they got and it was then that I realised I needed help. I made an appointment to see the mental health nurse at my GP surgery and she suggested that she started me off on a low dose on anti depressants to see if they helped. To be honest, the first few weeks I felt like they had made things worse but slowly I started to see an improvement. The nurse monitored how I was feeling on them and after a couple of years after much discussion I was weaned off them. It was only when I would get talking to people at playgroups and baby clinic that I realised just how many women locally were suffering just like I had and yet felt too embarrassed or ashamed to open up and say that they too were suffering from depression. From then I decided that I wouldn't just be another statistic and that I would be open about what I had gone through because if my experiences helped just one other person then it would be worth the stigma attached to it. At the very end of 2014 I found out that I was expecting again and was petrified about how this would affect my mental health(I had gone into premature labour in 2012 with another pregnancy and suffered really badly, but that's another post!) and how I would cope. I mentally prepared myself for the challenges that pregnancy, birth and a new baby would bring and we kept the pregnancy super secret(so much so that I was over halfway through before we told the few family members that we did tell). Sofia's arrival into the world was 2 weeks early and just as super quick as the others. Despite some feeding issues to begin with, I bonded with her instantly and she has been my little sidekick ever since. I didn't suffer with post natal depression and actually found myself to be the happiest I had been in a long while. Shortly after Sofia's first birthday I slipped whilst on holiday and after just 2 days away I had to be rushed to A&E by ambulance. Fortunately we were in the UK and after 9 days in hospital I had to have an operation and pretty much learn how to walk again. This accident has left me disabled and with that it brought those days of feeling low again but this time around I know how to deal with it. Ignoring those feelings and locking them away are the worse things you can possibly do because they just fester and get worse so now I'm very open with those around me on my bad days and believe it or not it helps keep them at bay. Since my accident I have limited sensation in my left leg and often walk funny which has brought on something that I've never suffered with before ANXIETY. I get anxious when I am out that people are looking at me because of how I walk or how I have to use items around me to sit down or stand up but to cope with that I have realised that despite me thinking everyone is looking at me, we live in such a fast paced environment where everybody else is so wrapped up in their own lives that nobody really cares that I walk with a limp or have to stick my bum up in the air to bend over, they really don't. I know everything is always easier said than done but if you are out there suffering, please don't. Speak to someone, anyone. A friend, colleague, doctor, partner or drop me an email. You'd be surprised by just how many people out there are in the same position and thankfully so much has changed in the last nine years that depression and anxiety is no longer a taboo subject. In fact the tables have completely turned and we are encouraged to talk about our experiences as therapy and as a way of helping others.